This new tracker had an interesting review done on it in the September edition of the Sky at Night magazine by Paul Money (see page 86). Having heard rave reviews about it from carlos_dfc and little col from this forum, following its appearance at Kielder early on this year, I placed an order for one which I recived in July from Ian King Imaging. Anyway I got my initial results with my new toy back this morning. In all I only managed 4 shots - and under a full Moon. However the aim of the exercise was to see how well my new baby could track. Unfortunately the shots with the slow 300mm lens didn't come out well enough to scan (using a H-alpha filter didn't help much either). However the 135mm shots were scanable (though the actual slides show more of IC1318 than is reproduced here). Anyway, all-in-all I am very pleased with the tracking ability of AstroTrac. This is a composite of two 135mm, 15-minute each exposures at f3.5. A H-alpha filter was used in the absence of my LPR being available to block off the 'pollution' from the full Moon. The film used was Kodak E200 slide film which is normally very red sensitive. The two shots were combined in [url=http://www.aurigaimaging.com]Registar[/url] and contrast, levels etc. slightly adjusted in Photoshop. As the shots came back red, the final image was converted to greyscale. I shall try some serious shots with my LPR come next dark side of the Moon and also try using longer focal lengths, too. An exccelent test image using the new tracker. This does look like an useful device for relatively quick set-up. I will be very interested to see more results from it when you get them. The Ha filter does indeed cut out a fair amount of 'light' but in my recent foray into Ha imaging, I had the advantage of using a sensitive CCD and 'binning' the images to get extra high sensitivity! Film is certainly the 'hard way' of doing it! 135mm lens and 15 minutes exposure. Was it simple polar alignment - not drift alignment? If a !quick polar align" then a 15 minute exposure - with no significant star trailing is very good. Interested to see what else this device can do. I have had a passion for astronomy for as long as I can remember. Coupled with an interest in daytime photography through a SLR in the 1980â€™s, I guess that it was only a matter of time before I combined the two interests into one and delve into the world of astrophotography. Over the past three or four years or so, mainly due to health problems, I have found this passion waning. My telescope of 15 years, an 11â€ SCT was being used less and less. I was getting to the point where I felt guilty about not being out under the stars on a clear, moonless night â€“ and secretly relieved when the night was cloudy (a common occurrence here in the UK). Early on in 2007 I reluctantly decided that it was time for me and my scope to part company. I felt in some funny way that I owed it to my scope to find it a home where it would get regular use and not spend night after night sitting idle in my makeshift observatory. Luckily I was able to find it a good home with a great astrobuddy of mine. The scope has probably had more use since then than it has had in the past seven years, while owned by me. Although I felt (and still feel) that I made the right decision in selling it, the sale left me with only a pair of 10X50 binoculars with which to observe the heavens. I would get a little frustrated on some exceptionally clear nights that I did not have any equipment to take at least wide field shots and ended up joining a site called Slooh where you could take images using their robotic telescopes, based in the Canary Islands. However, taking images through someone elseâ€™s telescope just didnâ€™t give me the same â€˜buzzâ€™ as imaging â€˜real timeâ€™ through my own equipment. Nevertheless, it was better than nothing at all â€“ so I plodded on using this robotic scope. In the early spring, here in the UK, there is a bi-annual star party held at a dark sky location. Several members of one of my English astronomy forums attended this gathering. When they returned home and reported back on the star party, it was obvious that there was an unusual air of excitement in the air? Why? 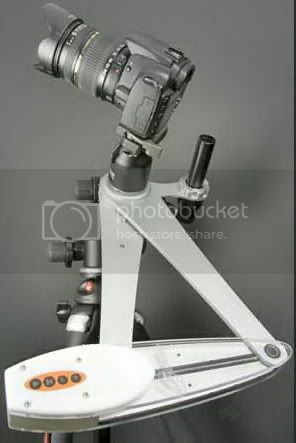 Because the event had been attended by one Richard Taylor who was demonstrating to the attendees a revolutionary new camera tracker he was instrumental in designing called AstroTrac (see image below). The star party were treated to a feast of images, taken with this curious-looking device. The main thing which had impressed the crowd was the sheer accuracy of the drive. Encouraged by the feedback on this new tracker, I did some research and scrutinised the AstroTrac website. Finally I decided â€“ this lightweight tracker was definitely for me! Accordingly I placed an order with a UK dealer for when the AstroTrac came on to the market. At the time of ordering, the unit was still being perfected. I was happy to wait a little while for a better product, rather than take possession of an inferior product a couple of months earlier. Then in July 2007 came that phone call from the UK dealer. The AstroTrac was now in stock and my order would be fulfilled straight away. I was delighted! On the appointed date, the courier delivered a long, rectangular box to my door. On taking possession of the package my first surprise was at how lightweight the package was! This, for me, would make astro imaging even easier. Quickly I opened the package and saw the strange looking object shown in the image above. The unit itself is largely made from aerospace grade 6082 T6 aluminium for strength and lightness. All nuts, screws and hardware are made from corrosion resistant stainless steel. The printed circuit boards are robotically manufactured in the UK and the unit uses two high performance microprocessors running at 20 and 16 million instructions per second. At the heart of the TT320 is the precision motor and screw assembly with the screw is an integral part of the motor to minimise periodic error. The screw, itself, is protected by transparent screw guards, which are made from polycarbonate, a material commonly used for bullet proof glass and riot shields! Quickly I turned to the instructions supplied with the tracker, wondering how, on earth, it operated. I soon learned that you use your tripod tilt & pan head as the latitude adjuster and then attach either another tilt & pan head or ball socket camera holder to the other end of the unit to which to attach your camera. One thing to note at this point is that the AstroTrac has a 3/8â€ threaded bolt and hole for attaching to your latitude adjuster/camera mount to. Therefore if your tripod * camera mount uses the standard Â¼â€ fitting, you will need to purchase a couple of adapters (1/4â€ hole to 3/8â€ bolt and 3/8â€ hole to Â¼â€ bolt), available from photographic stores. I opted for two additional items to enable polar alignment to be as accurate as possible. Firstly (and I believe very importantly to get the most out of this tracker) I purchased the optional AstroTrac polar alignment scope. This is a battery operated illuminated scope with adjustable brightness and giving precise cross hairs for polar alignment in both the northern and southern hemisphere (the southern hemisphere configuration is identified by the â€˜dotted lineâ€™ entries on the reticle while those for the northern hemisphere are in solid â€˜printâ€™. For us northerners, you roughly rotate the reticle until the patterns of Ursa Major and Cassiopeia are in alignment with it. You then make fine adjustments to put Polaris and what is termed a â€˜second starâ€™, the latter being easily visible from the city, into their respective places for each on the reticle. Et voila â€“ there you have it! The second purchase I made was for a geared tripod thread. This allows micro adjustments to be made in both azimuth and altitude to place Polaris into the correct position on the reticle. It goes without saying that the more accurate the polar alignment, the less (if any) trailing there will be in your images. Having set up and polar aligned the AstroTrac, I was ready to take it on its first tour of the heavens, despite there being a full Moon present in the sky. The picture above shows what the actual set up should look like. It was a pleasure to be able to set up such a lightweight unit in such a short time. Once set up, you rotate the tracker arm anti clockwise for it to track in the northern hemisphere and clockwise to track in the southern hemisphere. There are four buttons on the AstroTrac which keep its operation simple to use. First off there is a â€˜playâ€™ button. When initially pressed this will slew the tracker arm about 1â€ (25mm). It will then stop and give an audible beep to indicate that it is ready to track. Pressing the â€˜playâ€™ button again starts the tracker going. Once tracking, the unit flashes a green LED indicating all is well and that the tracker is tracking normally. One tip given to me by AstroTracâ€™s proprietor, Richard Taylor, to achieve maximum tracking accuracy, is to check the polar alignment each time that you begin a new exposure. I have found this advice to be very valuable, indeed. As previously mentioned, AstroTrac can give you up to two hours tracking before the unit has to be reset. As you approach the end of the two hours (around 15 minutes beforehand) the tracker will begin to bleep to warn the user that the two hours are nearly up. By pressing the â€˜rewindâ€™ button at any stage during the actual tracking will terminate the said tracking and cause the unit to rewind, allowing for another two hours imaging/observing to be done. The final two buttons control the brightness and volume of the AstroTrac unit. When set up, the Astrotrac has a soft red glow from internal LEDS. This allows you to see the four buttons with ease, as well as preventing you walking into it in the dark! The brightness can be set at five different levels, including â€˜offâ€™. A very handy addition to the unit over other trackers, in my opinion. The final button controls the volume of the bleeps that AstroTrac makes when approaching the end of the two-hour tracking sequence or in any of the â€˜Readyâ€™, â€˜Startâ€™, â€˜Stopâ€™ and â€˜Resetâ€™ modes. The volume has four levels to it, again including â€˜offâ€™. The AstroTrac is designed primarily for use with a DSLR or small telescope â€“ so using it with a film SLR where generally longer exposures are required was going to be a bit of a challenge for the unit. To date, the only trailing I have ever noticed in my images has been down to poor polar alignment as opposed to periodic error in the RA motor. You will see some examples of what this tracker is capable of at the end of this review. Since acquiring my AstroTrac last July, I have done more imaging than I did with my previous set up since 2000. I think that speaks volumes about my opinion of the unit! It is so easy and lightweight to set up, making it ideal for use at a dark site location or to take on holiday â€“ and most of all, it is fun to use. It has certainly revived my enthusiasm for the hobby and restored the sense of â€˜magicâ€™ that I havenâ€™t felt since the early to mid 1990â€™s. Yes, it isnâ€™t the cheapest tracker on the market â€“ but neither is it the dearest. I believe the saying that â€œyou get what you pay forâ€ very much applies in this instance and for the quality of the workmanship, the ease of use and the sheer accuracy of the drive makes this product worth every Dollar/Euro/GBP paid for it. Iâ€™m sure it will give me great pleasure for years to come. Finally, please note that I am not in any way affiliated with the Directors of AstroTrac. I am merely one very satisfied customer who is more than happy with his purchase. My thanks to both James Dyson and Richard Taylor for the images they have taken and allowed me to use to illustrate this review and for their general support, throughout. A single 5 minute exposure at ISO 800 taken with a Canon 400D and Takahashi FS-78 at 630 mm. The AstroTrac website doesn't give any specifics about why the unit is so accurate except to say that the screw assembly is "an integral part of the motor to minimise PEC" (see [url=http://www.astrotrac.com/Product.aspx?category=All+Products∏uct=AstroTrac+TT320]here[/url]). Speaking as a satisfied customer I have to say that I have been more than satisfied with the AstroTracs tracking ability to date. The owner of the unit, a Richard Taylor, would no doubt be more than happy to provide further info if required as he is a very helpful person, indeed. Certainly from reviews I've read from other AstroTrac owners, there appears to nothing but praise for the accuracy of the tracker; the secret to excellent tracking being, of course, accurate polar alignment. Edit: The only other reference I can find relating to the tracking accuracy of this unit merely states: "[b][font="arial"][size="3"][size="2"][font="arial"][size="2"]The motor and screw are custom made in the US to specification, for a tracking resolution of 0.3 arc seconds[/size][/font][/size][/size][/font][/b]"
I know youve said that your gp has ruled eye strain out but have u had an eyetest recently? are u keeping hydrated?